Ol Tukai Lodge is one of the best spots in the world to watch elephant with the backdrop of Africa’s highest mountain, Mount Kilimanjaro. Writers have described Ol Tukai and the surrounding Amboseli National Park ‘as a home for the Gods’. Ol Tukai is an Eco-rated lodge having excellent outdoor and indoor facilities with its unique collection of African art. The property receives overwhelming response from the international and local tourism market. Two rooms are designed to conform to EU standards to accommodate physically challenged guests. Special game vehicles can be booked at the Nairobi Office or directly at the lodge. Our well versed driver will ensure that it is one of the most memorable one hour drives of your life! Refreshments are served in the vehicle. On alternate evenings a troupe of Maasai Morans entertains guests with traditional songs and dances. This normally takes place after evening dinner at about 9.15pm. Ol Tukai is home to almost 300 species of beautiful African birds. Enjoy the bird walk that starts at the entrance of the hotel and winds its way under the canopy of acacia trees around the lodge. We have an in-house expert Ornithologist if you wish to learn more. Lectures are hosted regularly by researchers from Elephant Research Centre situated within the property. There are also lectures on the Maasai community conducted by our Maasai culturalist. Please watch out for events on the guest notice board. Children are welcome at Ol Tukai. Most bedrooms can accommodate an extra bed and baby cots are available on request. A special children’s menu and early supper is also available. Our resident Maasai will be glad to entertain your kids with traditional folk stories while you enjoy a relaxing dinner. There are 24 hour telephone and fax services. A radio call service is also available. We are proud to have a multi denominational chapel. Services are held every Sunday and all are welcome. This is a great location for couples who wish to “tie the knot” or even renew their marriage vows. 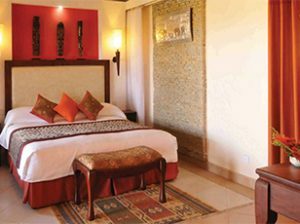 A special Wedding Package can be offered and arrangements made with our head office in Nairobi prior to arrival. Souvenirs and personal toiletries can be purchased at our well-stocked shop which is open daily. Please familiarise yourself with the notice behind your room door for evacuation information in case of fire. The lodge has a clinic with a qualified nurse. In case of an emergency the lodge will arrange an evacuation service to a hospital in Nairobi. P.O. Box 17 Nairobi, 00515, Kenya. © Copyright 2019 Tandala Tours & Safaris, Kenya, Tanzania, Dubai. Travel Agency by Rara Theme. Powered by WordPress .